Chic industrial elements and modern luxury finishes blend seamlessly in this stunning, authentic 2/flex 3-bedroom 2 bathroom loft for rent at coveted 39 Moore Street. 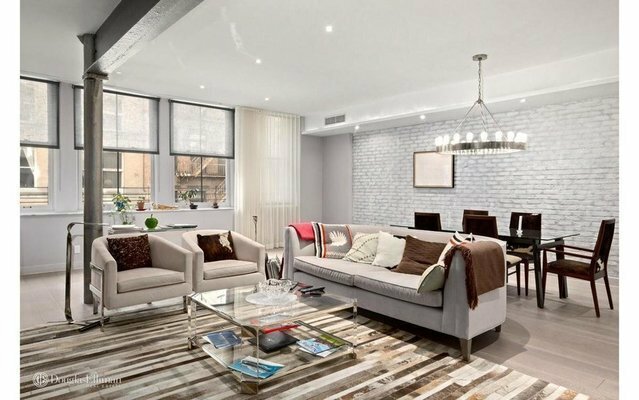 Located on one of Tribeca's most riveting blocks, this boutique condo building on cobblestoned North Moore affords an upscale downtown lifestyle along with peace and quiet and privacy with only 2 residences per floor. Expansive 3B is a vision of beauty and is offered fully furnished, with stylish furniture by Mitchell Gold and Bob Williams. The environment is pin-drop quiet thanks to complete soundproofing. The expansive living and dining room is perfect for entertaining and bathed in natural light from oversized south-facing windows. Gorgeous exposed brick walls, a fireplace, and steel columns enrich the ambience; while designer and recessed lighting provide a contemporary flair. A secluded den/home office off the living area has versatile use for movie watching, working or sleeping purposes. The chef will find inspiration in the sleek gourmet Italian kitchen featuring cabinetry by Scavolini, tan leather chromed hardware, marble countertops, Miele appliances and a built-in Miele Nespresso machine for your coffee indulgences. Two quiet bedrooms overlooking the tranquil tree-lined garden are positioned in the rear of the home. Other highlights include spa-like baths, a laundry room, and full sound system. Enjoy a premier address on Tribeca's best street, just 2 blocks from Hudson River Park, near fine shops, restaurants and galleries. 39 North Moore is an intimate elevator building with just 10 units. Live the downtown dream.